Surf City Blitz takes over Huntington State Beach this weekend, bringing together one of the greatest punk rock lineups in the history of Southern California with Roland Sands Presents The Moto Beach Classic's world-class motorcycle racing. 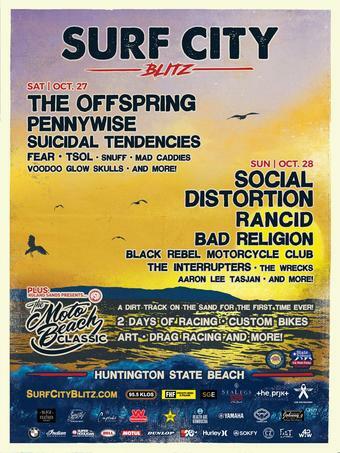 This brand new, all ages event takes place on October 27 and October 28 at Huntington State Beach as part of the SeaLegs Live Event Series, and will feature an all-star lineup of punk rock legends including The Offspring, Social Distortion, Pennywise, Rancid, Suicidal Tendencies, Bad Religion, and many more, performing on the shore of the Pacific Ocean in picturesque Orange County, California. Additionally, the second annual Moto Beach Classic combines Super Hooligan street bike flat track racing, drag and mini bike racing, art, custom motorcycles and, of course, the love of two wheels. The event will feature a dirt track on the sand for the first time ever and two days of Super Hooligan flat track racing. SPY Optics: The team from SPY will be “stoking out” attendees with games, swag, and an opportunity to win a massive shopping spree, as well as showcasing their line of polarized and contrast enhancing sunglasses all weekend long. Cupcake Wines: Cupcake Vineyards is excited to be the official wine sponsor of Surf City Blitz. Go see them at their Cupcake tent, where they'll have Cupcake swag and a Cupcake Photo Booth for you to snap a pic with your friends. Cupcake wines will be available for purchase at all beverage locations, featuring their Chardonnay, Cabernet Sauvignon, and their NEW Rosé. Sailor Jerry: Stop by the Sailor Jerry garage, grab a cocktail and toast to another American Icon, Norman “Sailor Jerry” Collins, Godfather of the old school tattoo! Lisa Johnson's Goldmine Garage: This area will feature a photo exhibition with a collection of images pulled from the vaults of SoCal music photographers Lisa Johnson, John Gilhooley, Rob Wallace, Madison Stern, Jason Cardwell and KRK Dominguez, plus featured art on display from Rancid's Tim Armstrong. Progamme Skate will be on hand to host signings all weekend, including Pennywise frontman Jim Lindberg who will stop by at 4:45pm on Saturday to sign copies of his book Punk Rock Dad, and VooDoo Glow Skulls will be signing after their set on Saturday. 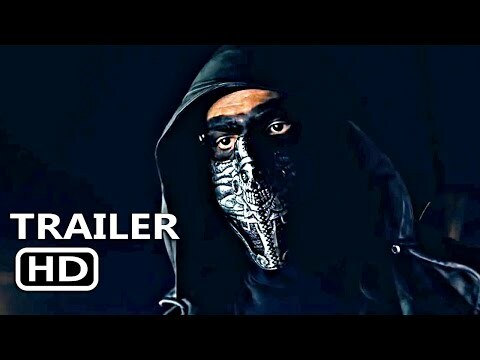 Author and T.S.O.L. frontman Jack Grisham will be signing his books all weekend at his Jack Is In zone, DJ Shiragirl will be spinning the ultimate Surf City Blitz Mixtape, plus OC street photographer James Bennett doing roaming portraits, and finally, Rock & Sock with vintage vinyl, and more. A limited number of General Admission tickets, single day and weekend Moto Pit Pass Upgrades (to accompany a festival ticket), as well as a variety of Surf City Blitz Merch Bundles, are still available for purchase at www.surfcityblitz.com. Surf City Blitz is produced by Synergy Global Entertainment, Inc. (SGE). Surf City Blitz at Huntington State Beach is located at 21601 Pacific Coast Highway in Huntington Beach, CA, and the festival entrance will be at the corner of Magnolia and Pacific Coast Highway. Limited parking will be available near the festival site. Ride sharing, public transportation and carpooling are encouraged. Surf City Blitz partners include: 95.5 KLOS FM, Rockstar Energy Drink, Yachak, Cupcake Vineyards, Sailor Jerry, Deep Eddy Vodka, Don Julio, Golden Road Brewing, Stella Artois, Corona, Black Feather Whisky, Health-Ade, Cosmic Fog, Layrite, Dixxon Flannel Co., SPY, Body Glove, Wienerschnitzel, Screaming Images, Musician’s Institute, Gringo Bandito, BMW Motorcycles, Indian Motorcycles, Hurley, Dunlop, Ducati, Motul, Husqvarna, Law Tigers, Kawasaki, West Coast Board Riders, Yamaha, Geico Motorcycle, Super Hooligan, Bell, Motul, K&N, SOKFY, Cycle Zombie and Fast Surfboards. A portion of Surf City Blitz proceeds will be donated to the Junior Lifeguard Program and the Living the Dream Foundation. LTD Foundation bridges together the music industry with fans who are fighting terminal illnesses by giving them All Access VIP experiences backstage with their favorite bands and artists. For more information, visit: www.ltdfoundation.org.